As we age, some of us will lose teeth due to disease, injury, or simple daily wear. In addition to bringing about unwanted changes to a person's facial appearance, missing teeth have a negative effect on that person's confidence and self-esteem. With the advent of implant dentistry, however, those who are missing one, two or several teeth no longer have to accept a lifetime of embarrassment and inconvenience. Dental implants, sturdy titanium posts that are anchored directly into the jawbone and topped with realistic replacement teeth, provide the security and usability of permanently placed teeth. Procedural advancements, including the development of narrower "mini" implants, mean that more people than ever before are finding themselves candidates for implantation. However, candidacy for implantation still varies, meaning that your dentist may determine that you should opt for an alternative restoration. Keep in mind, too, that dentists do not need a specific license by law in order to perform implant dentistry. A general or restorative dentist may perform the crown and bridge placement that is associated with implant restoration. 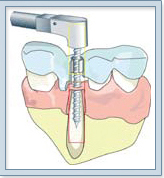 However, prosthodontists are the specialists who often complete this crucial procedure.